PHILADELPHIA – August 3, 2017 – Olympic bronze and silver medalist, Galen Rupp is set to compete at the 2017 American Association for Cancer Research (AACR) Rock ‘n’ Roll Philadelphia Half Marathon in partnership with Sidney Kimmel Cancer Center at Jefferson the weekend of September 16 – 17. Rupp will use the race as a training run for the 2017 Bank of America Chicago Marathon. Galen Rupp is a three-time Olympian from Portland, Oregon. He has represented the U.S. at the last three Summer Olympic Games, winning silver in the men’s 10,000 meters in London and bronze in the men’s marathon in Rio de Janeiro. 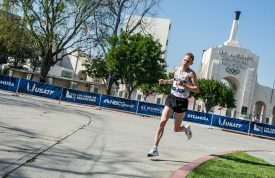 In April, Rupp made his debut at the Boston Marathon where he finished second with a time of 2:09:58. He has four American records including, the 10,000 meters with a time of 26:44:36, indoor 3,000 meters (7:30:16), indoor 2 miles with a time of 8:07:41 and indoor 5,000 meters (13:01:26). AACR Rock ‘n’ Roll Philadelphia will feature two-days of running with the half marathon on Sunday, September 17 at 7:30 am and the AACR Rock ‘n’ Roll 5K and 10K on Saturday, September 16 at 7:30 am and 7:00 am, respectively. Participants can take the “Remix Challenge” by running both Saturday and Sunday to earn the coveted Remix Challenge medal in addition to each race’s finisher medals. The half marathon will once again start and finish in Fairmount Park and will take runners on a scenic tour of downtown Philadelphia. Course highlights include, Benjamin Franklin Parkway, City Hall, the LOVE sculpture, the historic Eastern State Penitentiary Boathouse Row, Schuylkill River and more. The 5K and 10K will also start and finish in Fairmount Park. In true Rock ‘n’ Roll fashion, live bands, enthusiastic cheerleaders and spectators will line the race route, concluding with a celebratory finish line festival and post-race Toyota Rock ‘n’ Roll Concert Series headlined by Big Head Todd and the Monsters at Fairmount Park. Race weekend kicks off with a free Health & Fitness Expo, where runners can find the latest in running technologies, fitness apparel, health and nutrition information and interactive displays. The expo takes place at the Pennsylvania Convention Center on Friday, September 15 from 12:00 p.m. to 7:00 p.m. and Saturday, September 16 from 9:00 a.m. to 5:00 p.m. The expo is free and open to the public. American Association for Cancer Research, the first and largest cancer research organization in the world, is the race’s charity title sponsor. The AACR brings together the greatest minds to prevent and cure cancer through research, education, collaboration, and communication. The AACR promotes science education and training; and advances the understanding of cancer etiology, prevention, diagnosis, and treatment throughout the world. For more information about AACR Rock ‘n’ Roll Philadelphia or to register for the event, please visit RunRocknRoll.com/Philadelphia. The American Association for Cancer Research (AACR) Rock ‘n’ Roll Philadelphia Half Marathon will take place the weekend of September 16 – 17, 2017. One of the world’s most prestigious road races, the AACR Rock ‘n’ Roll Philadelphia Half Marathon is the home of five world records, five American records and the current men’s and women’s U.S. all-comers’ records. The race will give runners a first-class tour of Philadelphia and will start and finish in Fairmount Park. Participants can rock to the sounds of live entertainment along with enthusiastic cheerleaders along the course. Event weekend kicks off with a free Health & Fitness Expo at the Pennsylvania Convention Center on Friday, September 15, and Saturday, September 16. The Expo will have numerous vendors featuring the latest in running gear, nutrition and training tips. For more information, visit RunRocknRoll.com or follow @RunRocknRoll on Twitter.